Can CBD Oil Help You Quit Smoking? According to the National Institute on Drug Abuse, the use of tobacco is the leading preventable cause of death in the US. This is an alarming statistic. If this major killer is preventable, why are people still dying from its effects? Can you smoke CBD oil instead? Smoking CBD is not an adequate replacement for cigarettes, but it still may be able to help. Many people smoke, yet plenty of them don’t want to be smokers. What gives? Nicotine is highly addictive. Because of this, smoking can be a very challenging habit to kick. You can have all the will power in the world, but if your body is dependent on a substance, it can be extremely hard to kick. That is a huge number of people. But there has to be a solution. Previous smokers have proved that it’s possible to do. Current research, however, shows that cannabidiol, or CBD, oil has the potential to turn nicotine addiction on its head. It promises to do this in a safe, effective manner. How is this possible? Are smokers simply turning to smoking CBD oil instead? How Does Vaping CBD Oil Work? It is important to note that most people use CBD oil for medicinal purposes, not recreational purposes. It is not psychoactive, like the Delta-9 tetrahydrocannabinol (THC) compound in cannabis marijuana. This means that CBD oil will not affect your state of mind or get you high. Furthermore, CBD is normally a byproduct of the hemp plant rather than the usual marijuana plant. Growers breed hemp plants to contain a low amount of THC, if any. They prioritize CBD content in these strains. Still, CBD can affect your body in a positive way. CBD works by attaching itself to receptors in your body, possibly influencing it to use more of its cannabinoids. The receptors and neurons that make up this system exist in name as the endo cannabinoid system. Scientists recently discovered it. Its presence suggests that humans should intake cannabis in some form or another. The cannabinoids in cannabis bind to the special receptors in the body found in the endo cannabinoid system. They work together to protect the neurons and nourish the brain’s overall health. Research suggests CBD’s positive effects on everything from anxiety management to addiction, with few side effects. Because CBD compounds are similar to chemicals created organically in our own bodies, they may be better integrated into our systems than synthetic drugs. Knowing this, it is not a surprise that CBD has long been a favorite when it comes to use for beneficial purposes. According to Project CBD, Queen Victoria used CBD rich cannabis for menstrual cramps in the 19th century! It may sound unbelievable, but stranger things have happened. Users who want to try CBD oil can ingest it in many ways. Some of these intake methods include using an inhaler, mixing CBD into food or drink products, or taking CBD oil directly from a dropper. Users can even get their CBD in the form of a sublingual spray, which is placed under the tongue so that it can absorb through the salivary glands in the mouth. CBD is not usually smoked, inhaled, or ingested. Because of this, CBD oil does not pose the same risks as smoking tobacco or other substances. There is nothing burning or turning into a black, noxious fume. This is a popular question that many smokers ask. Can they just shift the smoking habit to something more healthy? Can you smoke CBD oil? Is it less harmful than smoking cigarettes or tobacco? While smoking is not an option since CBD oil is not a dry herb or leaf-like other marijuana substances, vaporizing is an option. Vaporizing CBD oil is a popular method of administering the oil. What makes it popular? Well, it mimics the hand to mouth habit that smokers prefer. They can receive the same subconscious comfort or soothing that smoking provides, only they’re not using a cigarette or producing any smoke. Vaporizing also has some benefits over other CBD intake methods. Namely, it helps with bioavailability. Bioavailability is a fancy name for the amount of a substance that is available for the body’s use. When a substance enters the body, its bioavailability is how much of it actually enters the bloodstream and thus the body’s circulation. In other words, this is the amount of the substance that is able to have an active effect on the body. To say it still another way, not all CBD that is consumed will affect the user’s body. This is because its bioavailability is only at about 15 percent. CBD is hydrophobic, which means that it is not very water soluble. Because of this, it is hard to keep it in the bloodstream. It is also reduced by the liver upon consumption, before it ever gets a chance to enter the bloodstream. Thus, having enough CBD to actively affect the body can be more difficult than it sounds. Vaporizing CBD bypasses the liver because it enters the lungs and diffuses directly into the bloodstream. This allows for maximum bioavailability, which is around 50 to 60 percent. Doing it this way provides potentially beneficial effects while using a smaller amount of CBD product. It is a more effective and efficient way to use CBD oil. It also brings the effects on much more quickly, as a user does not need to wait for it to pass through the gut to become active. Vaporizers work by heating CBD oil to its vaporization point. This is around 320°F to 356°F, which is much colder than the combustion point at 450°F. By staying below the combustion point, vaping CBD oil ensures that what is produced is vapor, not smoke. This helps the CBD user to avoid toxins, carbon monoxide, particulates, and other unhealthy problems that smoking introduces. On the other hand, when smoking a cigarette, the temperature of the burning tobacco can reach up to 900°C or 1652°F. This reaches well beyond the point of combustion! That helps partially explain why smoking is so unhealthy for our lungs and our bodies as a whole. University College London researchers Celia J.A. Morgan, Ravi K. Das, Alyssa Joye, H. Valerie Curran, and Sunjeev K. Kamboj conducted a study into smoking CBD oil. They set out to measure how CBD via inhaler impacts cigarette consumption for smokers who were desiring to quit. In the study, 24 smokers divided into two groups. The groups either received inhalers containing CBD oil or a placebo with just ethanol. All participants had to use the inhalers whenever they felt the urge to smoke during a one week period. The placebo group showed no difference in their habits. However, the group who received CBD oil in their inhalers reduced their cigarette consumption by 40 per cent on average! This has huge and far-reaching implications. The study also showed some maintenance of this effect during follow up. This is an encouraging finding. If a switch to CBD oil can cut down on cigarette consumption by providing a healthy alternative, many smokers may finally be able to quit. Other research showing the effect of CBD usage on addiction is positive. Many different studies all suggest the same thing: CBD may be a great solution for people struggling with addiction. Another showed that CBD lowers stimulus cue-induced heroin-seeking behavior. This can help to prevent heroin craving and usage relapse. Clearly, there may be a lot of potential for CBD oil and its positive effects on overcoming addiction. This especially includes nicotine addiction and smoking cigarettes. The University College London study shows that smoking CBD oil can, in fact, help people quit smoking. This can truly change the lives of the high number of smokers who want to quit. The positive effects of quitting smoking begin just 20 minutes after giving up smoking, and they last for years. It is always a good time to quit. CBD oil may be able to help. 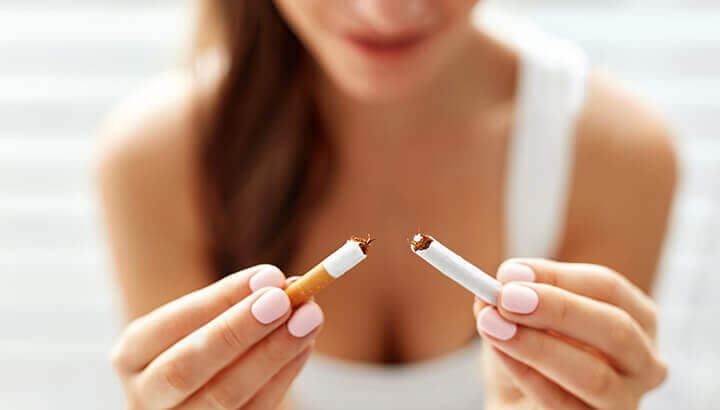 If it is able to help even a few people kick their dangerous smoking habit, then it has made a difference in their lives. Check out our CBD Vape Pens as a fastest way to introduce your daily intake to your blood stream. We sell CBD in all kinds of forms. Whether you want to vaporize CBD or simply rub it into your skin, we have an option for you. Browse our site to pick a CBD product that seems right for you. This entry was posted in CBD Science and tagged can you smoke cbd oil, cbd smoke report, smoking cbd, smoking cbd oil.